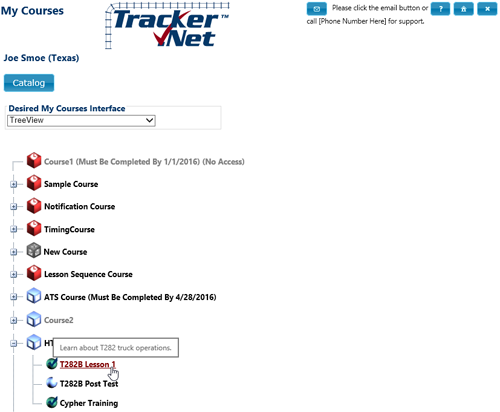 I have dabbled with a few LMSs besides Tracker.Net and it is clearly #1 for value and flexibility. We’ve completed our study/evaluation of LMSs, starting with over 70, down to 25, and then a short-list of 5 vendors, to a final 2 vendors. Just a quick FYI... we obtained final sell off today after another test with a classroom full of cadets stress testing the system. We also spent an hour with three instructors answering their final questions about the system and as we always knew it would, the entire system performed perfectly! I just checked and we have 568,252 StudentLessonInformation records - so Students X Lessons taken - and that doesn't count when an employee has taken a lesson twice because it has annual or quarterly expiration. Our system takes a beating and I would say that we are extremely satisfied. Glad to hear that Tracker.Net is getting a good reception. I think it is a wonderful software.